~The Senior Movers is the Name and Company that is Synonymous with Seniors in need. ~ We are Senior Moving experts. We are not like most companies that specialize in residential moves and then slide over into the Senior field. The majority are not trained, they are not vetted to be inside a Senior community and this is in no way what they do on a daily basis. Seniors are our lives, it is all we do. It is everyday for us and we do not cross over into residential, commercial and office moving. Our niche is well defined with Seniors in mind. ~ We are a Full Senior Moving & Services Company. We offer Moving, Internal Transfers, Packing & Unpacking, Donation drop off, Downsizing Assistance, Placement Assistance with our Community Partners, painting and minor repairs to get existing residence ready for sale, clean up and clear out (including debris removal), Realtor assistance and more! ~ We are well versed and trained on how to best accommodate and service a Senior during their transition and in a way that reduces the anxiety that can come during this time. While you may see other companies that list similar services to us, it is the execution of those services as well as all of the intangibles that truly differentiates us. The attitude of our team, how we're dressed, how we're willing to rearrange things as many times as necessary so it's to the resident's satisfaction, our timeliness and our overall Compassion, Care & Patience for the Senior and their loved ones. In every way we pride ourselves on making sure our clients Experience The Difference from all the rest when they hire The Senior Movers. ~We have a very robust website to better serve our clients (theseniormovers.com/). There, many questions can easily be answered for a resident or their family member (s), moves can be scheduled, you can read our reviews or place one yourself. We are an Honest family owned business. We believe Trust is everything and it is paramount inside a Seniors home, apartment, or unit. ~ Another difference when choosing our company! 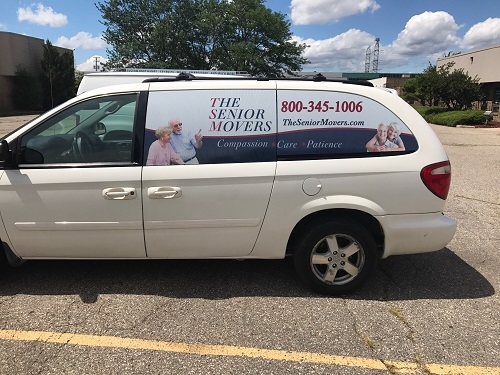 The Senior Movers is a Smoke/Tobacco Free Zone - It is strictly prohibited for a TSM team member to smoke on our moving truck, at or around a Senior's residence or on a Senior Community Campus. We take this matter very seriously for the health and well being of our clients, their property and the property of our Community partners! ~ Unlike just about every other company, we hold our company and every one of our team members accountable. On our website, there are two areas where a resident or their family member can hold us accountable, the Review section as well as the Rate our Performance section. You can comment on anything you would like without censorship from The Senior Movers. Though we are not perfect, we can guarantee that if and when we make a mistake, we will make it right instantaneously. It is our obligation as a company. ~ We ask for the opportunity to earn your trust and earn your business and referrals. ~ Rest assured that when you refer The Senior Movers, you'll be glad you did. Over 98% of our clients use us multiple times. We Thank you for your continued patronage and look forward to serving you for years to come. "The highest praise our clients can offer us is the referral of their family and friends. Thank you for allowing us the opportunity to earn your trust"